The following is the eighth message that we received in Egypt this past March 2012 over Equinox. You can find our other messages on our website at www.alunajoy.com under the "Articles for Personal and Planetary Transformation" link. It might be a good idea to read them in order as each message builds upon the previous one. We are sharing this message here with you just as we received it, in present time, with very little editing. We do this for a very important reason. We know that the messages that we receive are not just for our groups, but are for others as well. The Atlantean/Egyptian Masters and the Star Elders assure me that the message and the corresponding energy will be transmitted to you. So as you read this, you might want to imagine that you are with us. Also, always view the photos on the website that we share, as photos also hold some energy of the sites. 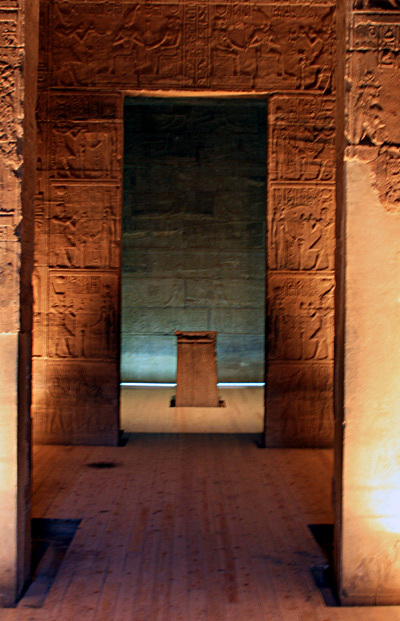 Our group entered the Temple of Isis at Philae before dawn and went directly to the center of the temple . . . the Holy of Holies. We begin at the center and worked our way out of the temple because that is how the temples were built. Working our way from the center outward, we bring back into the world the energy, frequencies, and pure wisdom that are the core intent of each temple. We would like to invite all the Ascended Masters of the Great White Brother/Sisterhood of the North and the Ascended Masters of the Seven Rays of the South to join us now. We would like to invite all the Archangels, as well, to join us in this Holy of Holies. We ask that you infuse this temple with your light and presence. We are now standing in a perfect bubble of light. The Guardians of this temple have already felt honored by our offerings and gifts of our hearts. But they said that we are in charge now, not them. A baton has been passed to us, and because of this we are the ones that now call in the Masters from the North and the South, the Brotherhood of the Seven Rays, St. Germain and the Great White Brotherhood, Archangel Michael, and all of the seven Archangels. Goddess Isis and the beings called "the Immortals" that dwell in this temple, we invite you to be with us, see our searching hearts, and help us claim our new position and live our destiny. We ask that the cup (chalice) within us that has been emptied at Kom Ombo - the chalice that held the misqualified energy of this passing age, which we released from our bodies and from the past and the present - be refilled now with pure creative force from the great central sun and core of our universe. We ask that our "child within" be filled with pure creative energy that we may use in the coming days, now and into the future. We ask that this pure energy be offered to all those around the world who are also working today with the equinox energies; to all those who have also come here at this time as an act of service to this present age to be bridges for all life into the new world; and to all those on the other side who are helping form other dimensions to help rebuild the new world (and to those reading this). All three states of awareness that we bridge - past, present, and future - exist simultaneously now. Past, present, and future merge; time, space, and dimensions become one. Body, mind, and spirit are once again unified, as the world of duality dissolves in front of our eyes and our hearts. All our natural, God-given talents, which for a time felt supernatural to us, have now become natural and normal. These talents are the instant manifestation of all our highest aspirations. What we focus upon we can manifest. We are the "I Am That I Am That I Am." We ask that this unification be anchored into all light-searching hearts. When we walked into the Temple of Isis, we could feel the positive energy following us through the doorways, and now I am feeling light from above coming down onto the altar, the Holy of Holies. This light from above will activate the altar stone, which is also connected to a grid work of altars all across the world - some of these are known, some are yet to be discovered. We (and those reading this) have done many years of work in preparation to activate this net of light around the planet. And today, as the Masters step back and let us step into our own divinity and mastery, we are the ones now activating this grid. We are doing so with guidance but without their assistance anymore, because the Masters say we no longer need their help. We are now stepping into their shoes - the shoes that they had filled in this present age. We will be the torch carriers, the light carriers, for the next age. All the beings across the planet that are also celebrating this time are our brothers and sisters. They are now the Masters of the East, the South, the North and the West, the center, the above and the below. It appears that the Masters we have invited in, are bringing in all the pieces from our past, present, and future; body, mind, and spirit; time, space, and dimensions. They are bringing all of this into the center of our hearts. We have emptied out, cleared out and prepared, our chalice within as a seed, or an egg, that is being activated in order to bring us all back to the Source within. So inside this chalice (the center of our hearts) is nothing but perfection: divine perfection, perfectly clear, creative energy - pure potential in its rawest form. This energy is our tool for building a new world. The Immortals understood the creative force of the universe - the light energy - so they knew how to use it to create with sound. The Immortals understood a world beyond duality, or actually before duality even existed, and they are giving this understanding to us now (and to those reading this). They are happy for us because we have remembered the world beyond duality, and they are happy that we have come back home. So they want to welcome us home, not just to this temple, but to the home within, inside, ourselves. Sekhmet said come back, and we have come back - not only to places we have been or where we have learned - but we also have come back to ourselves. Now Archangel Michael, the Ascended Masters of the Great White Brother/Sisterhood of the North, and the Ascended Masters of the Seven Rays of the South are moving around our circle; and with your permission, they would like to seal this energy within us so that the outer world can't touch it for a few days, until it has time to anchor within us. They want to seal this light, energy, frequency, and wisdom that we are collecting here within our hearts. We will learn how to use it bit by bit. They also say we will realize more about this energy and its use when we are in the Kings Chamber. So let's take a moment of silence in gratitude and thanks to Archangel Michael, the Ascended Masters of the Great White Brother/Sisterhood of the North, the Ascended Masters of the Seven Rays of the South, and the ever-present Immortals for the blessings that they have given us. It is a blessing that we have been called to be part of the shift and transition of ages.